The stem is erect and hairy with two sharp edges. The leaves are stiff and thread-like and do not have prominent midribs. They have short blades and the basal leaves are composed of overlapping leaf sheaths. The flower head is somewhat rounded wherein the flower stalks radiate from a common point. The weed is propagated by seeds. Each plant can produce up to 10,000 seeds that can easily germinate upon reaching maturity. The root system of Globe fringerush is fibrous, growing in all directions to easily compete with other plants for moisture and soil nutrients. It is an alternate host for armyworm, hairy caterpillars, rice bugs, nematodes, and fungal and bacterial diseases (Rice IPM, 2001). 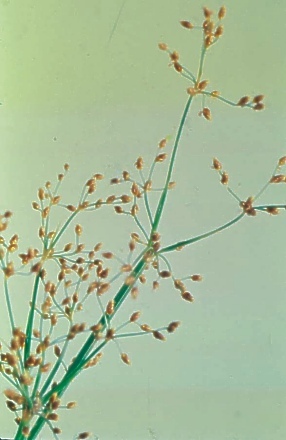 Studies show that Globe fringerush is found to be resistant to 2,4-D on rice fields in Kedah, Malaysia, and to Pyrazosulfuron-ethyl, also on rice fields, in Santa Catarina, Brazil (Weed Science, 2005).